A worst-case scenario for the future of tropical forests is based on beliefs that tropical forests are unusually fragile, that continued population growth will raise demands for forest products beyond what they can produce, that increased dependence on technology will result in faster and more catastrophic destruction of resources, and that human greed, misguided public policies, and market failure will also cause destruction of tropical forests no matter what else is done to protect them. All these beliefs are based on experience. However, there are alternatives. The belief that tropical forests are unusually fragile is based on ideas of ecosystem properties that have been modified since the 1970s when they were prevalent. Today, ecologists emphasize tropical forest resiliency and its capacity to regenerate after natural disturbances. Tropical forest environments have changed and continue to change at an accelerated pace as a result of human activity. Although the change can be directed to minimize negative effects, even under a best-case scenario, future tropical forests will be exposed to different atmospheric conditions and may support a different combination of species, including more exotic and cosmopolitan species and fewer endemic species. Humans must step up management activities to include the whole landscape over a long-term scale and use ecologically sensitive technologies to rehabilitate damaged ecosystems. Human populations will have to be concentrated to better distribute food and fiber, process waste water, and minimize damage to the biota. 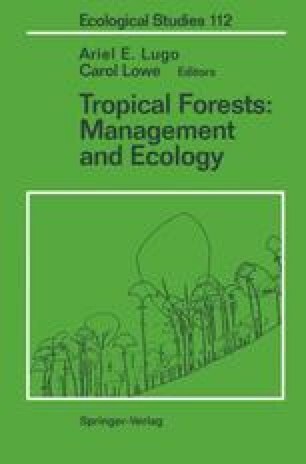 Success in managing tropical landscapes will depend on the attention given to socioecological factors, the education of the population on issues of resource conservation, the focus of research activity, and the strengthening of resource management institutions. It is ironical that the climax equilibrium of the humid tropics should now prove to be far more fragile than all other vegetation types on earth. … Everything that rainforests do is “wrong”; lack of colonizing ability, poor synchronization of reproduction, clumsy seeds, narrow tolerance of environmental change, and so on.